Beginning in 1937–1938, the SS created a system of marking prisoners in concentration camps. Sewn onto uniforms, the color-coded badges identified the reason for an individual’s incarceration, with some variation among camps. 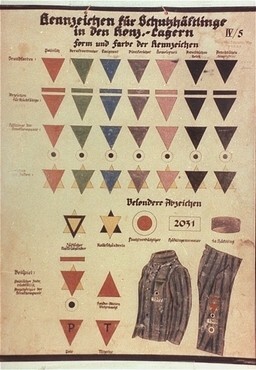 The Nazis used this chart illustrating prisoner markings in the Dachau concentration camp. Why did the SS have a system of badging and identification within the camps, if everyone was a prisoner? How do badges and numbers dehumanize individuals?